There's a war raging on Spokane's north side. And it's being fought with Nerf guns. Members of Spokane's Firefly LARP. A Trojan Horse scenario is unfolding aboard the spaceship Ace of Spades, which is lost somewhere in outer space. And then: chaos. Men scream, and shoot at each other with darts. They hide behind walls made of mattresses and Styrofoam and roll to the ground once shot and killed. The darts — looking more like multi-colored tampons — now litter the basement floor. The ship’s pilot storms the enemy attackers with flying fists and duct-taped knives that had been tucked inside his black pants, leather vest and cowboy hat. And he wins. Hypothetically, of course, because this is make-believe — the most serious, intelligent, crazy form of make-believe. It’s called LARP — live-action role-playing — and tonight, 20 adults and a few children on Spokane’s north side are acting out the sci-fi television series Firefly. Tonight, these space cowboys run around shooting the hell out of each other with Nerf shotguns, bows and arrows, rocket launchers, and knives made from foam wrapped in duct tape. 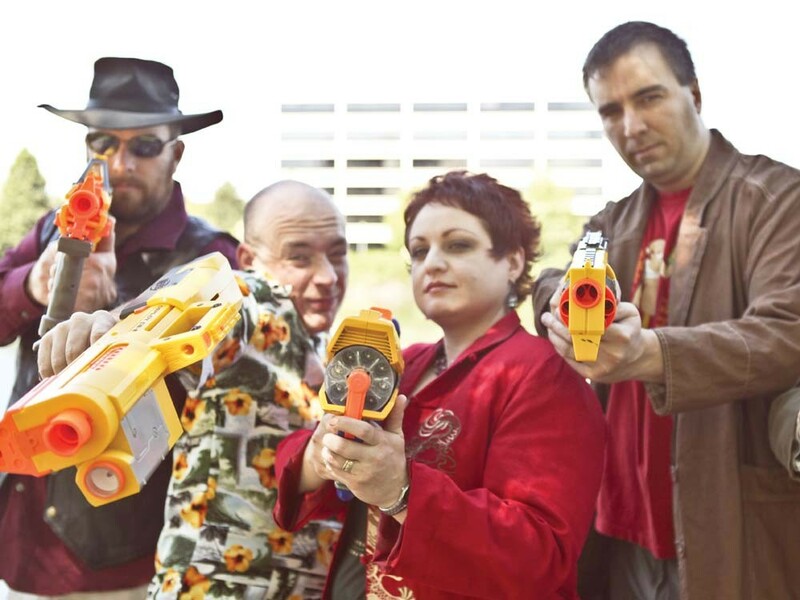 They’re LARPers — a sort of unholy offspring of Dungeons & Dragons players and theater nerds. And with those powers combined, they’ve created a subculture of wicked-awesome gamers. Denise Davis harvested a player’s kidney for money. A graduate biology student at Eastern Washington University, she plays a character named Haddy Josephine Davis, who wears a silk Asian shirt, black pencil skirt and long dangly earrings. Haddy comes from an affluent family and became addicted to drugs and started selling them on the side while she was in medical school. Davis is one of about four women in the local Firefly LARP. Although she says their families don’t understand their hobby (she just found out her sister thinks it’s unhealthy), they love the community, creativity, and escapism that comes with gaming. The couple still plays D&D —a tabletop role-playing game — but also meets weekly with gaming groups to play cyber-punk games likes Star Wars, Spycraft and World of Darkness. Denise is also part of a second local LARP group in which players pretend to be vampires. Which means battles are mostly won and lost through bouts of rockpaper-scissors and each character’s skill level. Unlike the Firefly LARPers, there’s not as much knock em’ down, shoot em’ up action here. Dellwo and Davis are part of a regional Camarilla LARP. The fan-organized game is played internationally through White Wolf Publishing. In this game, characters act out an interactive soap opera within a supernatural realm called the World of Darkness. Thousands of players assume their own unique characters and, despite being separated by distance, all of these players (through email and conventions) play in the same world or chronicle. The Spokane group will meet with players from Seattle, the Tri-Cities and further afield at this weekend’s SpoCon convention. The group typically meets at libraries but moves outside to the parking lot if combat breaks out. Dellwo and her husband, Joe, are loyal gamers. Their two children are just now getting old enough to LARP. Dellwo, a freelance writer for About.com, has been gaming for more than 20 years. Her current character, Beth, is a 22-year-old college student that went crazy when she was bitten and transformed into a vampire. Dellwo wrote a biography of her character, even creating a Facebook page for Beth so that she could learn about other reallife 22-years-olds. She says that, unlike rule-intensive games like Dungeons & Dragons, LARP is vast. Gamers are only confined by the limits of their imagination. Like a good book or movie, it is the ultimate escape from reality — one that you can share with other people. Dellwo says this social element is crucial to not only the game but the players themselves. “This is definitely a geeksubculture thing,” she says.